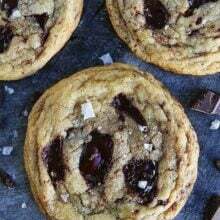 Brown Butter Chocolate Chip Cookies-soft, chewy chocolate chip cookies with chocolate chunks, nutty browned butter, and a sprinkle of sea salt. This chocolate chip cookie recipe is guaranteed to be a family favorite! Chocolate Chip Cookies, Everyone’s Favorite! You all know I LOVE a good cookie, especially a good chocolate chip cookie. Who doesn’t love a good chocolate chip cookie? They are everyone’s favorite dessert, especially when served warm, fresh out of the oven with a glass of cold milk. Oh man, my cookie cravings are strong and I NEED a cookie now. Good thing I just baked another batch of Brown Butter Chocolate Chip Cookies. I am currently obsessed with these cookies. They are SO good! 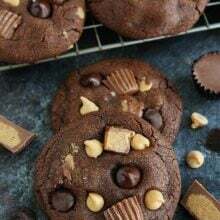 The recipe comes from The Cookie Book, by my friend Rebecca and if you are a cookie monster, like me, you are going to LOVE this book. 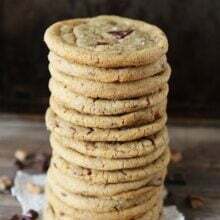 Rebecca knows how to make good cookies, we are cookie soul sisters:) It is filled with 75 cookie recipes and you are going to want to make every single one. And I highly suggest you start with the Brown Butter Chocolate Chip Cookies because they are insanely delicious! Making browned butter is simple, but the results are BIG! 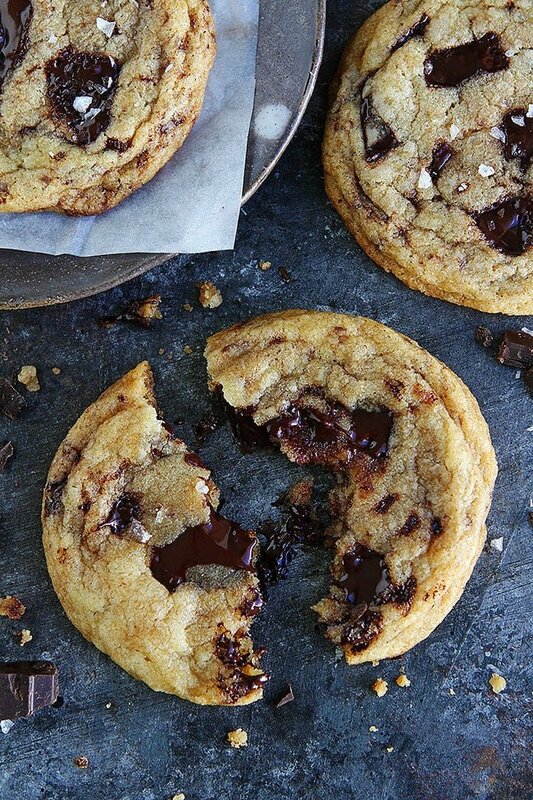 You will love the nutty, caramel-y flavor the brown butter adds to the chocolate chip cookies. This step is KEY for making this chocolate chip cookie recipe. To brown butter, put the butter in a small saucepan and melt over medium heat. Once melted, turn the heat to medium high. Continue stirring and look for small golden bits that will start to settle on the bottom of the pan, this should take around 3 to 5 minutes. Once this happens, take it off the heat and pour into a medium, heat-safe bowl to cool for a few minutes. 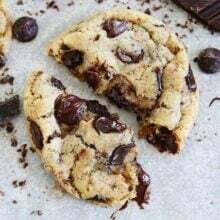 You are going to love this chocolate chip cookie recipe because the dough comes together in no time. You don’t need a mixer and you don’t have to chill the dough. You can easily whip up a batch of these brown butter chocolate chip cookies whenever you have a cookie craving! Here are a few tips for making the cookies. This chocolate chip cookie recipe uses brown butter and oil. Make sure you use a neutral oil like sunflower seed oil, canola oil, or vegetable oil. The oil keeps the cookies very soft. Always pack the brown sugar into the measuring cup. Make sure the eggs and milk are at room temperature. Use a mix of all-purpose flour and bread flour. You can buy bread flour at most grocery stores. It gives the cookies structure and makes them extra chewy. Always use pure vanilla extract. 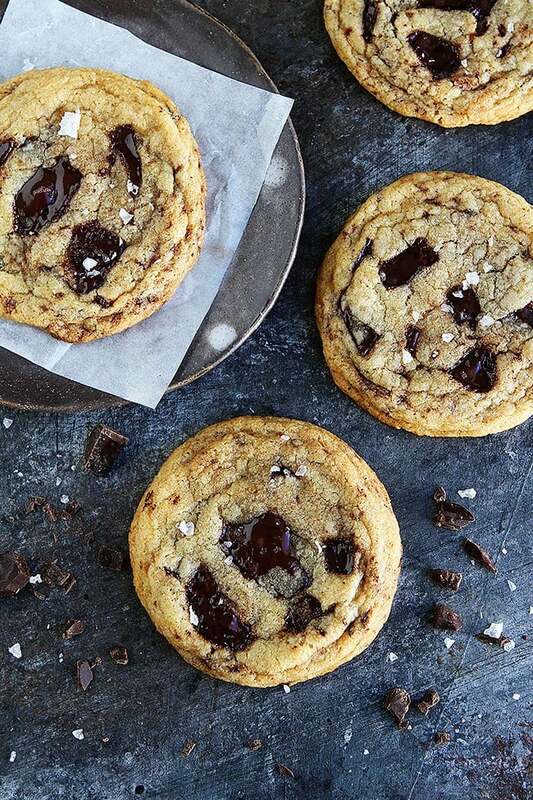 Don’t forget the sea salt, a sprinkling of sea salt is a MUST for the best chocolate chip cookies. Bake the cookies on a baking sheet that has been lined with parchment paper or a Silpat baking mat. Don’t over bake the cookies. You want them to still be soft in the middle when you take them out of the oven and just slightly brown around the edges. The cookies will finish baking while they are cooling. Let cool on the baking sheet for 5 to 10 minutes. You don’t need to chill the cookie dough, but you certainly can. Wrapped tightly, the cookie dough will keep in the fridge for up to 5 days. You can also freeze the cookie dough balls in an airtight container for up to 2 months. You can store the baked chocolate chip cookies in an airtight container on the counter for 3 to 4 days. You can also freeze baked cookies for up to 2 months. After they are cooled completely, put them in a freezer bag or freezer container and freeze. I think you are going to LOVE this chocolate chip cookie recipe. 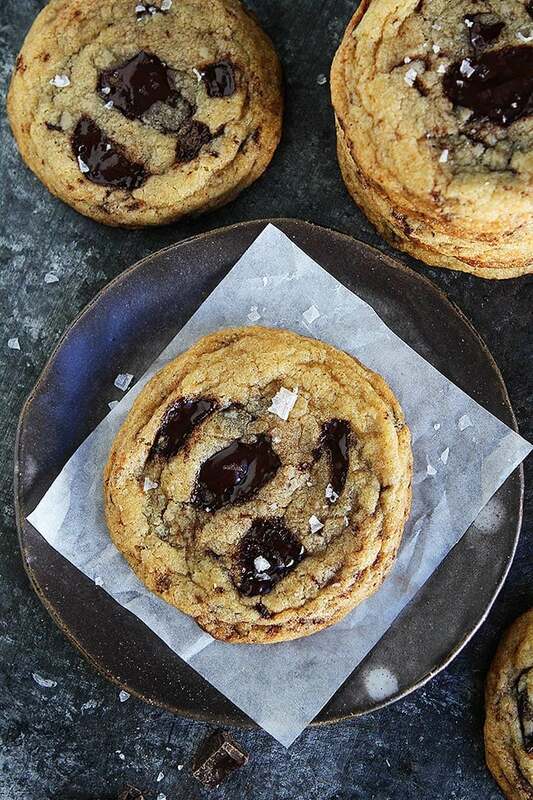 The brown butter makes the cookies EXTRA special. The cookies are soft, chewy, and loaded with chocolate. And the hint of flaky sea salt is the perfect finishing touch. The next time you are in the mood for chocolate chip cookies, give these Brown Butter Chocolate Chip Cookies a try! I guarantee you will be baking them over and over! And make sure you check out The Cookie Book for LOTS for more delicious cookie recipes! The brown butter makes these chocolate chip cookies extra special! They are going to be one of your favorite chocolate chip cookies! Preheat your oven to 375 degrees F. Place a rack in the top third of the oven at least 6 inches from the heat source and cover your baking sheets with parchment paper or a Silpat baking mat. Put butter in a small saucepan and melt over medium heat. Once melted, crank up the heat to medium high. Continue stirring and look for small golden bits that will start to settle on the bottom of the pan. It will smell deliciously nutty and caramel-y. This should take around 3 to 5 minutes. Once this happens, take it off the heat and pour into a medium, heat-safe bowl to cool a bit. When the butter is cooled slightly, whisk in the brown sugar, granulated sugar, and oil. Once smooth, add in the eggs one at a time, completely mixing in the first before adding the second. Whisk in the milk and vanilla until blended. Be sure to scrape down the sides and bottom of the bowl to make sure everything is incorporated. In a medium bowl, whisk together the all-purpose flour, bread flour, baking powder, baking soda, and sea salt. Add the flour mixture to the brown butter mixture and mix until just blended and you still see streaks of flour. Add in the chocolate chunks and continue to blend until the chocolate is evenly distributed throughout. Gently roll 2 tablespoons of the dough into a ball. Place the dough balls on the prepared baking sheet about 2 inches apart. Sprinkle each with a pinch of sea salt flakes, if using. Bake one sheet at a time for 11 minutes in the top third of the oven. Let cool for 5 to 10 minutes on the baking sheet, and then transfer the cookies to a rack. Oh how I adore your cookie recipes! Seriously, they are the BEST! I’m adding this one to my bookmarks, they look so soft and gooey, not to mention those big flakes of salt! These sound amazing! I totally need to give them a try soon! WOW! 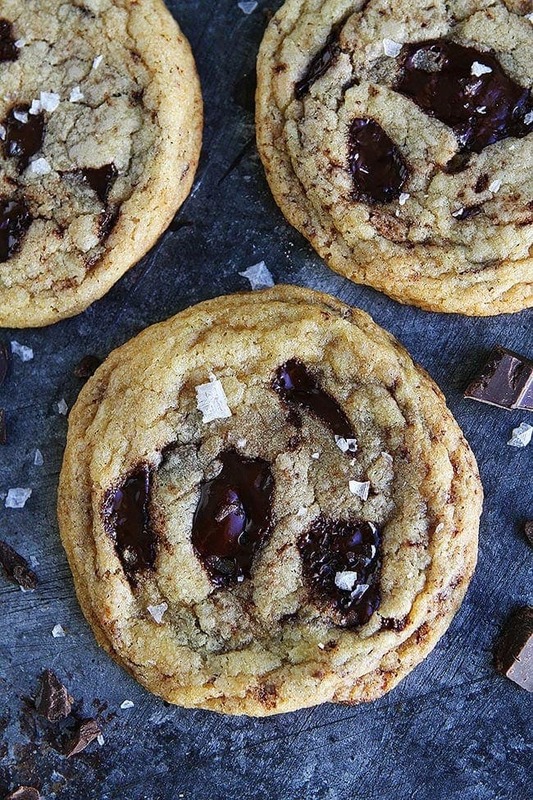 These cookies are sweet and salty perfection! These are very nice cookies, and so easy to put together. I chilled mine and was very happy that the cookies did not spread excessively. Also, I preferred baking the cookies at 350 rather than 375 degrees. I would highly recommend these treats! I halfed the recipe but mine ended up being more puffy and less flat. Any tips?